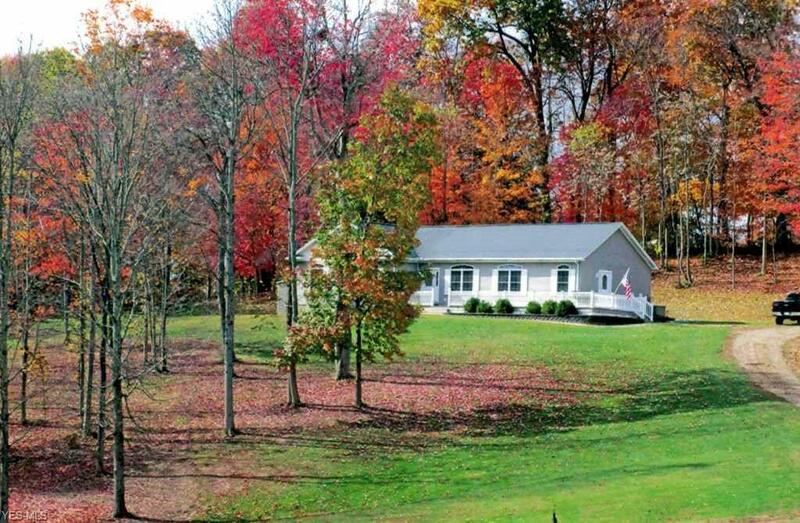 Picturesque country setting ranch built in 2005 with so many amenities you will fall in love. The home offers 3 spacious bedrooms all with walk in closets. The master bedroom offers a walk through closet and an on suite with a walk in shower, 2 person garden tub with jets and double sinks. The kitchen has cabinets galore, all appliances, Corian countertops and open concept to counter bar and eat in dining. The eat in kitchen opens to the back deck for outdoor dining. Gorgeous formal dining room overlooks the neighbors’ pond. Living/Family room has additional space for a writing desk. Large hall closet for additional storage. Mud room on the north side entrance houses laundry area with even more storage and a half bath. Crawl space is nice and clean with visceral and pea gravel for convenient and clean access. Don’t ever worry about losing power as the whole house generator uses automated switch over in less than one minute of losing power. The generator is powered by an underground propane tank with easy ground level access. All the tasteful landscaping professionally done by Dave’s Landscaping. The 2 car detached garage offers a garage door opener, separate breaker box, propane heater, poured walls and a loft for additional storage. Additional outbuilding and a huge hunting potential for deer, turkey and other wildlife from your own yard. Don’t let this chance of a lifetime get away. Listing agent must be present for all showings. © 2019Northern Ohio Regional MLS. All rights reserved. Information deemed to be reliable but not guaranteed. The data relating to real estate for sale on this website comes from Northern Ohio Regional MLS and the Broker Reciprocity Program.sm. Real estate listings held by brokerage firms other than Team Realty 1st are marked with the BR logo and detailed information about them includes the name of the listing brokers. Listing broker has attempted to offer accurate data, but buyers are advised to confirm all items. Information last updated on 2019-04-25.